Currently learning about aircraft piston engine. 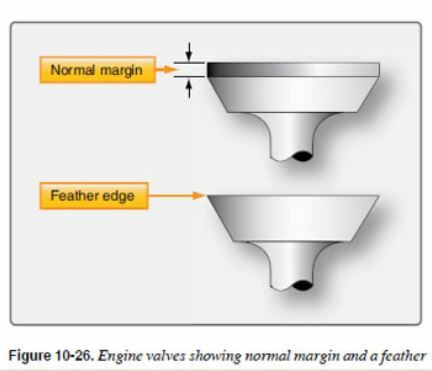 Feather edge can be found at the engine valves as according to the picture. Can someone explain briefly about what is feather edge? Why it is bad? Which part of the engine that has the feather edge? A thin edge is called a feather edge and can lead to preignition; the valve edge would burn away in a short period of time, and the cylinder would have to be overhauled again. Basically during a rebuild over-grinding the valves can lead to a feathered edge which in turn can lead to higher/faster engine wear. Essentially by grinding the edge to thin you cause the limited remaining metal to wear out much faster. This can also lead to valve seating issues and out right leaks. Not the answer you're looking for? Browse other questions tagged engine piston-engine or ask your own question. Can anyone explain why and how flames shot out of an F/A-18 as it crashed?